The cat is an extreme Carnivore. They eat and need solely meat. Raw meat diet or BARFing (Bones And Raw Foods) means to offer your cat a healthy, natural nourishment. 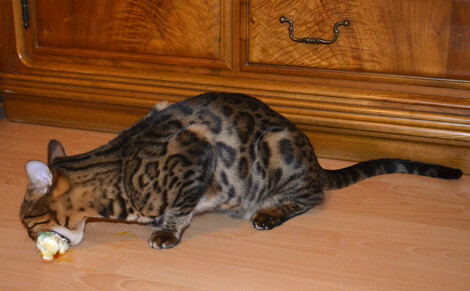 We feed all our cats raw meat and have great experiences with it. 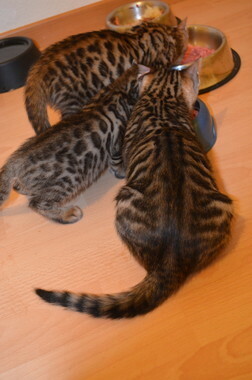 The cats love it and they are super healthy and compact. There are now several shops in Switzerland who have dedicated themselves to BARFing. It's important to use supplements to ensure that the cats get all the nutrients they need. We are using Felini Complete. Furthermore, cats should not eat raw pork. In pork, a virus can be present that causes Aujeszky's disease. For cats,this untreatable infection always ends fatal within just a few days. Aujeszky's disease is caused by the Aujeszky's disease virus. The pathogen belongs to the herpes family of viruses. 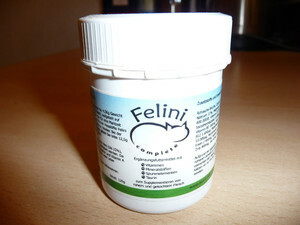 If you follow the rules of BARFing you can offer your cats a natural health precaution due to changing to raw meat. For me, the raw meat diet was initially simply a healthier alternative to commercial pet food. But now its become important to me to let pet owners and animal lovers know and draw attention to this issue. Lots of commercial animal feed may lead to diseases. Studies show, for example, that with a commercial animal feed fed cats have a 2.5 - 5 times higher risk of suffering from an overactive thyroid, which is attributed to certain additives such as soy isoflavones or phthalates. Other known subsequent diseases are allergies, diabetes, cancer, arthritis, tooth decay, tartar, periodontal disease, chronic digestive problems, ear infections, bladder and prostate inflammation, gallstones, kidney failure, unexplained itching and skin and coat problems. The list is long. Industrial cat food often contains carbohydrates in the form of grain tomeet the needs of the cat in fiber (wet food), but also to shape the food and as a cheap filler (especially dry food). An amount up to a maximum of 10% is considered acceptable. But in most dry cat foot the amount is much higher for production reasons and reasons of storability. Road kill, sewage sludge, former pets, egg shells - would you feed your pet all these ? Under the following links you can find out the truth behind commercial pet food. Warning - The content is graphic. If you still want to use industrial food you should pay attention to the ingredients. We buy our raw meat at www.goldenway.ch/ and sometimes in normal supermarkets. As an addition, we feed our cats whole day-old chicks. We get ours fromwww.animalco.ch. We won't write about any BARF recipes or instructions in here because there are already many good websites regarding this topic. However, for a german recipe you can check out www.chaoskatzen.de.